For the current edition, see Internatia Song Contest 82. For the upcoming edition, see Internatia Song Contest 83. The Internatia Song Contest is a monthly singing competition held among many of the active member countries of the Internatia Broadcasting Union (IBU). Each member country submits a song to be performed on live television and radio and then casts votes for the other countries' songs to determine the most popular song in the competition. The Contest has been broadcast every edition since its inauguration in 2011. It is also one of the most watched non-sporting events in the Internatia. The contest was based on the Eurovision Song Contest. The first Contest was held in the town of Sansails, Spirevo, on 4 December 2011. Eight countries participated — each submitting one song. This was the only Contest in which less than ten songs were performed: since the 2nd edition all Contests have had more than 18 participants. The 1st Contest was won by Territrius. The format of the Contest has changed over the editions, though the basic tenets have always been thus: participant countries submit songs, which are performed live in a television programme transmitted across the Internatia Network by the IBU simultaneously to all countries. A "country" as a participant is represented by one television broadcaster from that country: typically, but not always, that country's national public broadcasting organisation. The programme is hosted by one of the participant countries, and the transmission is sent from the auditorium in the host city. During this programme, after all the songs have been performed, the countries then proceed to cast votes for the other countries' songs: nations are not allowed to vote for their own song. At the end of the programme, the winner is declared as the song with the most points. The winner receives, simply, the prestige of having won, and the winning country is invited to host the second next edition. The programme is invariably opened by one or more presenters, welcoming viewers to the show. Most host countries choose to capitalise on the opportunity afforded them by hosting a programme with such a wide-ranging international audience, and it is common to see the presentation interspersed with video footage of scenes from the host nation, as if advertising for tourism. Between the songs and the announcement of the voting, an interval act is performed. These acts can be any form of entertainment imaginable. As national broadcasters join and leave the IBU feed, the IBU/Internatia logo is displayed. Eligible participants include Active Members (as opposed to Associate Members) of the IBU. Active members are those who are located in states that fall within the Internatia Broadcasting Area, or are member states of the Council of Internatia. Active members include broadcasting organisations whose transmissions are made available to at least 98% of households in their own country which are equipped to receive such transmissions. If an IBU Active Member wishes to participate, they must fulfil conditions as laid down by the rules of the Contest. The winner of the contest will have the opportunity of hosting the second next edition. If they decline to host, the country who placed 2nd will host. If that nation also declines to host, the line of hosting rights goes to the next country on the list until a suitable host is found (situation like that happened only once, when Kosma hosted ISC 6, despite placing fourth in ISC 4). Most of the expense of the Contest is covered by commercial sponsors and contributions from the other participating nations. The Contest is considered to be a unique opportunity for promoting the host country as a tourist destination. Preparations for the event start a matter of days after the host wins in the two previous editions, and confirms to the IBU that they intend to—and have the capacity to—host the event. A host city is chosen—usually the capital—and a suitable concert venue. The voting systems used in the Contest have changed only once during contest run. Since 2nd edition countries award a set of points from 1 to 8, then 10 and finally 12 to other songs in the competition — with the favourite song being awarded 12 points. Due lower number of participants in 1st edition voting system was different. 1st 12, 10, 8, 6, 4, 2 and 1 points Some countries had jury members and some countries used televote to decide which songs would get points. 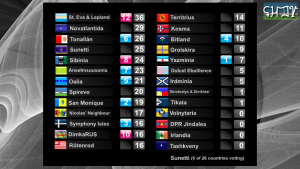 2nd – present 12, 10, 8, 7, 6, 5, 4, 3, 2 and 1 points Some countries had jury members, some countries used televote and some 50/50 combination of jury and televoting to decide which songs would get points. Electronic scoreboard, as Sunettian votes are announced in 7th contest. After the interval act is over, when all the points have been calculated, the presenter(s) of the show call upon each voting country in turn to invite them to announce the results of their vote. Often the opportunity is taken by each country to show their spokesperson standing in front of a backdrop which includes a famous place in that country. Currently, the votes from 1 to 7 are displayed automatically on screen and the remaining points are read out in ascending order by the spokesperson, culminating with the maximum 12 points. Countries must announce the country names and points in English the scores are repeated by the Contest's presenters in the other language. The order in which countries would present their votes during Final is decided by host country. Voting order has to create as much suspense as possible when the votes were revealed. There is no specific rule if country has to use 100% jury, 100% televote or 50/50 combination of jury and televoting. According to one study of Internatia voting patterns, certain countries tend to form "clusters" or "cliques" by frequently voting in the same way. Yet another study concludes that as of 10th edition voting blocs has, no occasions to crucially affected the outcome of the Contest. 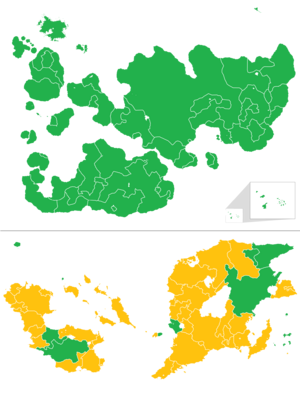 Another statistical analysis of the results between 6th and 10th edition suggests the occurrence of regional block voting; it is a matter of debate whether it is primarily explained by conscious political alliances or by a tendency for culturally close countries to have similar musical tastes. Historically, Kosma and Tonallán would exchange points at an average of 11.4 points per contest. Several countries can be organised into voting blocks which regularly award each other high points. The number of countries participating each edition has steadily grown over time, from eight participants in 1st edition to over 25 in the 7th edition, when twenty-six countries participated in the competition. Because the Contest is a live television programme, a reasonable time limit must be imposed on the duration of the show. In recent editions the nominal limit has been three hours, with the broadcast occasionally overrunning. Because 35 countries announced intention to participate in Internatia Song Contest, a qualification round, known as the semi-finals, was introduced for the 8th Contest. In each of the semi-finals the voting is conducted among those countries which participate in that semi-final in question, a draw is conducted to determine in which semi-final each of countries will participate. In contrast, every participating country in a particular year may vote in the grand final — whether their song qualified from the semi or not. After the votes have been cast in each semi-final, the countries which received the most votes—and will therefore proceed to the grand final—are announced by name by the presenters. Full voting results are withheld until after the grand final, whereupon they are published by host country. In ISC 8, 10 countries from each semi qualified to grand final, which joined host country, setting a total number of songs in final to 21. In ISC 9 number of qualified nations were increased to 12 from each semi, increasing a number of finalists to 25. Due to large number of participants - over 50 countries in ISC 15 - the number of qualifiers were increased again, this time to 13 from each semi, making the total amount of 27 countries in the grand final. There have been 81 contests, with one winner each edition. Forty-six different countries have won the contest. Territrius won the first contest. The country with the highest number of wins is Chruno with six wins. Tashkveny have finally won ISC after 48 participations, an ISC record. Eriod has the most participations in ISC without a win (70). Map showing each territory's number of Internatia wins up to and including 78th edition. 1Novatlantida and Leshia won representing the same territory. 2Harlequenia and Pen Island won representing the same territory. 3Symphony Isles and Alteus won representing the same territory. 8th – 11th Big star with caption "Internatia Song Contest", encircled by square flags of all nations that participated in ISC. 12th – 28th Abbreviation "ISC" in center, encircled by round flags of all nations that participated in ISC. since 29th The current generic logo was introduced for the 29th Internatia Song Contest in Kosma, to create a consistent visual identity. The host country's flag appears in the first "a" of the generic logo. Each edition of the contest, the host country creates a sub-theme which is usually accompanied and expressed with a sub-logo and slogan. To celebrate every 25th edition of the contest, a Congratulations contest occurs. 57 countries took part in the first one with songs from the previous editions of ISC and the winner was Pen Island with The Pierces ("Kings"). Internatia Second Chance Contest (2013 – present), a contest dedicated to non-winning NF songs of Internatia Song Contest. Junior Internatia Song Contest (2014 – present), a contest dedicated for Internatian artists aged 16 and under. Internatia Song Contest –1 (2014 - present), a contest dedicated to retro entries released mainly before 1990. Internatia Theme Contest (2017 - present), a contest dedicated to a changing theme in each edition. Internatia Classical Music Contest (2015 – 2016), a contest dedicated to classical music. Hipsternatia Song Contest (2016), a contest dedicated for songs whose most viewed Youtube videos have less than 1 million views. ISC Revisits ESC (2018 - present), a contest dedicated for ESC revotes throughout the years. ISC Revoting ISC (2019), a revote contest dedicated to the past editions of ISC. ^ Since 8th edition, contest has included two televised semi-finals. ^ Final results show was held in Esonáth, Lost Islands. ^ The 28th edition was co-hosted by Bubblique with semi-final 1 being held in Burbuja, Bubblique. ^ The final was held in Chruno Spacecraft due to the demolition of Chruno-Deux for this specific event. ^ a b c d e f g h This song was partially sung in Polish. ^ a b c d e f This song is trilingual: the first two verses are in French, the chorus is in Italian and the last verse is English. ^ a b c The majority of the song is in English but it features one phrase in German. ^ a b c d This song was partially sung in a fictional language called Quenya. ^ a b c d This song was partially sung in Dakota, a Native American language. ^ a b This song was sung in a fictional language called Dragon. ^ a b c d The first verse of the song is a Sanskrit prayer. ^ a b This song contains a few words in English. This page was last edited on 3 April 2019, at 12:14.